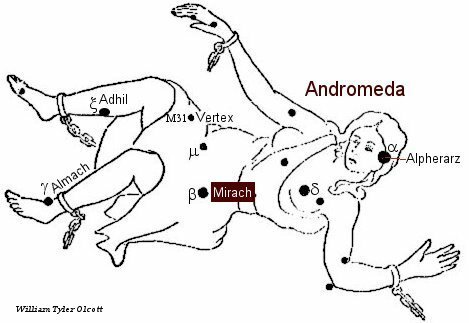 The orange-colored star Mirach in the constellation Andromeda acts as your guide star to 3 different galaxies. The star Mirach (Beta Andromedae) in the constellation Andromeda acts as the guide star to three different galaxies: M31 (Andromeda galaxy), M33 (Triangulum galaxy), and NGC 404. 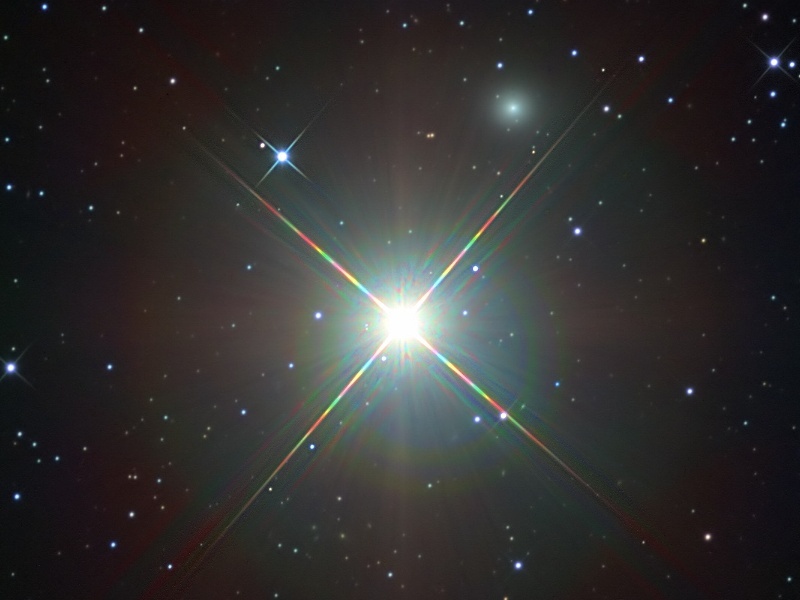 When you gaze at this star, it might occur to you that – while Mirach lies at a distance of only 200 light-years – it can aid in finding objects that are millions of light-years away. View larger. | The Andromeda Galaxy with two of its satellite galaxies, via Wikimedia Commons. Mirach, or Beta Andromedae, is a familiar guide star to this galaxy. 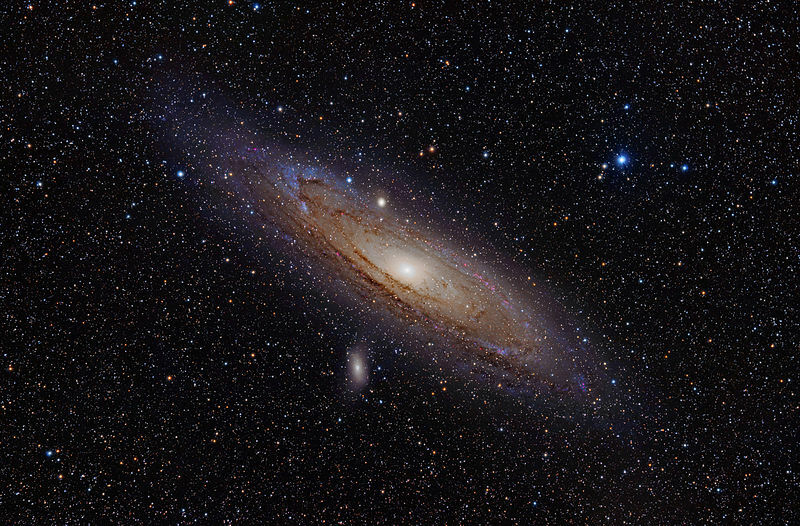 Use Mirach to find the Andromeda galaxy (M31). A line drawn from the star Mirach through the star Mu Andromedae escorts you to the Andromeda galaxy. This galaxy is the nearest large spiral galaxy to our Milky Way, and it’s the most distant thing you can see with your eye alone. You need a dark moonless sky to see it with just the eye, though. Click here to read more about the Andromeda galaxy. The Triangulum galaxy, aka M33. The star Mirach can help you find it. It is a face-on spiral galaxy, often photographed, but difficult to see with the eye although it is one of the closest galaxies. 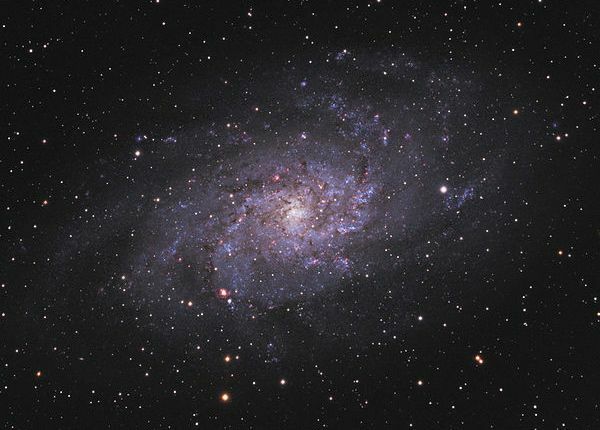 Use Mirach to find the Triangulum galaxy (M33). 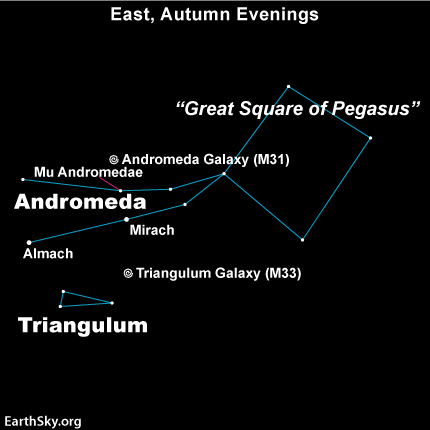 A line drawn in the opposite direction – from the star Mu Andromedae through the star Mirach – takes you in the direction of the Triangulum galaxy. This galaxy is a nearby face-on spiral galaxy, often photographed, but difficult to glimpse with the eye alone. Mirach sits midway between the Andromeda and Triangulum galaxies. Click here to read more about the Triangulum galaxy. M31 and M33 weren’t recognized as galaxies until the 20th century (1901-2000). Before then, these faint fuzzies were referred to as nebulae. Astronomers in earlier centuries didn’t have telescopes powerful enough to resolve galaxies into individual stars. In the later 18th century (1701-1800), the great comet hunter Charles Messier listed M31 and M33 as masquerade comets in his famous Messier catalogue. View larger. | The bright star in this image is Beta Andromedae, otherwise known as Mirach. Look more closely, and you’ll also see Mirach’s Ghost, a round, faint, fuzzy galaxy in the upper right of the photo. This galaxy, also called NGC 404, happens to be seen nearly along the line-of-sight to the star Mirach, which is a relatively bright star and makes photographs like this one a challenge. Credit and copyright: Anthony Ayiomamitis at perseus.gr. Used with permission. 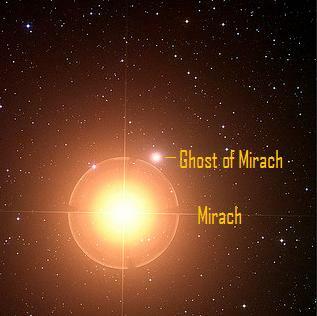 Use Mirach to find Mirach’s Ghost (NGC 404). So where is the third galaxy, sometimes called Mirach’s Ghost or NGC (New General Catalogue) 404? Look at Mirach, and you’re looking almost exactly in the direction of NGC 404. The galaxy lies about one-tenth of one degree from Mirach (the full moon equals one-half degree). This galaxy is located about 10 million light years away. It apparently lies just beyond our Local Group of galaxies (both the Andromeda and Triangulum galaxies are part of the Local Group) and does not appear gravitationally bound to it. William Herschel was the first to notice Mirach’s Ghost, in the year 1784. 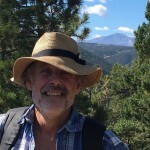 Today many amateur astronomers try to spot it with their small telescopes, but – due to its proximity to the star Mirach – seeing the galaxy is not easy.